Join Doc and Mary for their monthly classics literature show on the Humboldt Homepage. Doc and Mary will discuss the remarkable work, Letters from Prison, by Dietrich Bonhoeffer. 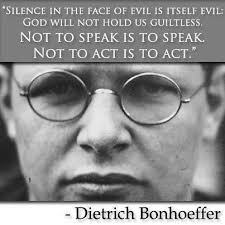 A young Christian theologian, Bonhoeffer was imprisoned in 1943 and executed by Adolf Hitler’s Nazi regime in 1945. Bonhoeffer wrestles with meaning in the face of despair. This entry was posted in Classics Now and the Northcoast Book Discussion Group - Classic Literature with Doc Stull and Mary Harper and tagged Christianity, despair, Meaning.